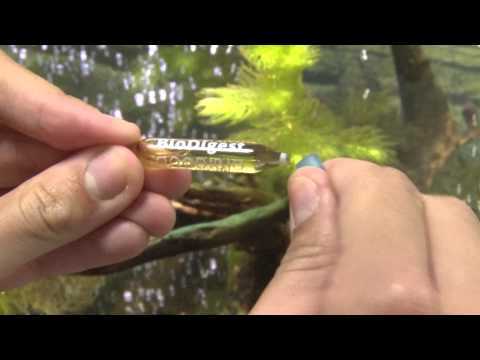 Stop Ammo traps ammonia and reduces the proportion of nitrites when starting up a new aquarium and in water used to transport fish. This prevents the fish from being shocked or killed. Stop Ammo is made from the extracts of specially selected plants. The plants in question have developed a special molecular system with the capacity to trap ammonia nitrogen. Ammonia nitrogen is particularly volatile and toxic and is firstly stored in a non-volatile, non-toxic form, and then synthesized in the form of food, namely proteins and amino acids. The saponins have been removed in order to make the plant extract suitable for use in aquaculture and aquariums (saponins are poisonous for fish gills). WHEN SHOULD YOU USE STOP AMMO? Stop Ammo can be used in the following cases: • In your aquarium to limit an accidental rise in nitrites, caused, for example, by a dead fish. • In water used to transport fish to reduce the water’s ammonia content by 15- 50%, cutting the risk of fish disease and stress. • When your fish are acclimatising to reduce or eliminate fish loss and encourage quicker acclimatization.